Sometimes I just need a bath. I don’t mean because I’m necessarily dirty, and showers are better for that sort of thing anyway. Sometimes I just need a soak in some hot water. A good book possibly, relaxing thoughts, the tension slowly melting from my shoulders. Sometimes at the end of a complicated day, there is nothing like a bath. Sometimes however, the weather just doesn’t cooperate. 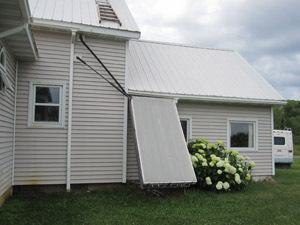 We try our best to use the amount of hot water that the sun gives us through our solar collector. I think there may be a pride thing going on here. After all, I designed, built, and installed this system for free hot water from the sun, and by golly, whatever it gives us is good enough. When I looked at the temperature gauge, though, it was not hot enough for a tough guy like me, so I turned on the backup hot water heater for an hour before the much needed bath. I’m thinking my next strategy for soaking the tension out of my body will be a sauna, which I also designed and built. I’ll keep you posted. Alice and I are working on next winter’s woodpile. I think we’ve done 4 Scout loads or so. It is hard to predict how much wood will make a Scout load while I’m cutting, so I just do the best I can. I put all the logs I can carry on the rack I made, and saw them up in a batch. The ones too big to lift I saw up in place and stack up over by the log splitter. That is where Alice comes in. When I get a batch ready to split, I start the machine and she mans the lever. 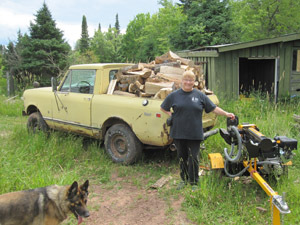 As I load the logs onto the splitter, she does the splitting, and then I toss the split pieces onto the Scout, put another one on the rack, and wham! She splits that one too. As you can see in the picture, I cut up more pieces than could properly fit into the bed of the Scout. The poor old girl was kind of saggy when I drove around to the woodshed. I do my best to get the load off as soon as I can, because that much weight is not good for a 40 year old vehicle. I’m thinking that 3 or 4 more loads like this one and the woodshed attached to the garage will be full. I plan to build a new outbuilding this summer to replace the old worn out one. I’ll fill the new building up with firewood and use from there until I get enough room to use it for storage. Then I’ll empty the old one, tear it down, and remove one more eyesore from the property. One of the finest things I’ve done in my life was leading several MOOSEWATCH Expiditions on Isle Royale. Moosewatchers hike the back country of Isle Royale for a week collecting data for the longest running predator/prey study in the world. Besides being able to contribute to this noble research project, and besides being able to hike where few can on Isle Royale, I’ve met some very fine people on these trips… people who have changed my life in positive ways. When my left knee started acting up, I reluctantly had to pass on the MooseWatch expeditions. Isle Royle’s back country is no place to become immobilized because of a blown knee, and having the leader be the immobilized one would be especially troublesome. I still wanted to contribute something to the study, even if I could no longer do the hikes. So I came up with… dried strawberries. The very reasonable cost of the MooseWatch expedition includes food, which is assembled for the crews at the base camp. The food is good if a little bland, and after several days out on the trail, some variety in the diet is most welcome. 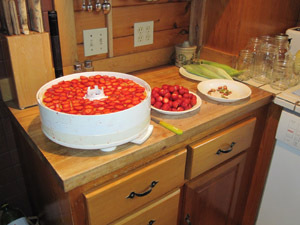 So when the local strawberries are ripe, we purchase enough to dehydrate and contribute to the MooseWatch project. We took a trip to Drummond Island in the middle of this year’s strawberry season, and were afraid we’d miss the local berries. (The store bought ones are ok, but for real strawberries, you can’t beat local ones fresh from the field.) On my way home from a trip to Copper Harbor today, I noticed some strawberries on the outside table of our local grower, so I stopped, backed up, and bought 5 quarts. Some we preserved for our own use, but most were meticulously cleaned, sliced thin, and laid out onto the dehydrator racks. When the dehydrator is turned on, magic fills the air. It is worth it to go outside for a while and forget about the berries, because when you come in, the most wonderful smell is filling the air. My best wishes for the MooseWatch crew that gets these dried berries. May they give you the strength to help solve one of the great scientific mysteries in a beautiful corner of the planet. 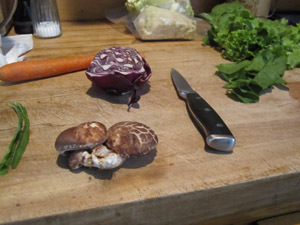 We harvested our first Shiitake Mushroom today. The story about how we started the mushrooms is HERE. I also posted a story about the inoculation and placement of the logs HERE. So after much effort to fell the sugar maple tree, buck it up, drill numerous holes in the logs, press in the spore thimbles, stack them by the pond, water them regularly all last summer, soaking them for 24 hours, and resting them on the newly constructed cedar rack I built, we have exactly one clump of mushrooms to show for it. If these mushrooms are worth $500, then I’d say we’ve broken even if we pay ourselves minimum wage for the time and materials we’ve put into these things. This is not a complaint, by the way. One of the most satisfying things I do is figuring out how to do something I’ve never tried before and actually getting it to work. And wouldn’t it be a nice problem to have way more Shittake Mushrooms than you could use? 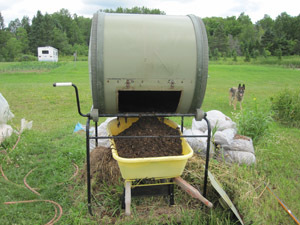 I got a couple of very nice wheelbarrow loads of compost from the drum, which I then shoveled out onto both gardens. 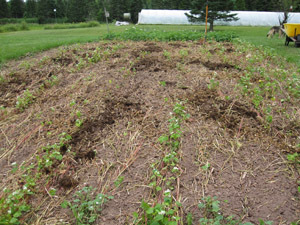 I’d recently rototilled the first planting of buckwheat in the dormant half of both gardens, so I sweetened the earth with the compost and some more manure before I tilled the second time and replanted the buckwheat. The seeds are underground, watered, and hopefully germinating as we speak. It has been a good gardening season so far. Some things are doing great, while some are doing very well. We haven’t gotten skunked by anything this year, which is a good thing. The rains have been steady and plentiful, the weather has been mostly warm, and the mosquitoes have been above and beyond! I was thinking that the mosquitoes have stepped up to the plate since the bees are less plentiful. It makes sense — both have stingers. It is a shame we live such short lives. In my early 60s, I’m getting a better view of the end of that proverbial tunnel, but along the way I’ve figured a few things out; things that might have ironed out a few bumps in the road for me if I’d have know them earlier. One of these revelations occurred to me yesterday at the visitation for the death of our dear friend Steve Seidel. Steve was just my age, and died of brain cancer. Lots of people die every day, so why, I wondered, did this one hit me so hard. As Steve’s friends and family were sharing their grief at that event yesterday, I encountered Steve’s two children, who I’d mostly lost physical contact with over the years, but still maintained a Facebook relationship. Both were sad, of course, but clear-eyed, erect, and facing the great challenges of life before them with a confidence that I frankly found both startling and comforting. “These two will do just fine,” I said to myself. One of my favorite sayings is, “it takes a village to raise a child.” Then I realized why at least a very important part of the bond that connected Steve and me existed… I was part of that village! We had trusted each other with our children, and they had learned from us that adults are not some fearsome authority, but just possibly were smart and capable allies that can help you do things you’d not be able to do otherwise. Having had no such adult influence in my younger life, I suddenly saw the power of this concept embodied in these two fine young people, and in their offspring as well. What a powerful revelation. And what a comfort it is to know that at least part of the myth of immortality is true… that we’ll live on through the actions of our children. My first favorite “Steve story” took place on a cross-country trip with the Boy Scouts for a backpacking trip in the Weminuche wilderness area in the 4-corners area of the western US. We drove during the days, and camped at night with the boys on this trip. On the way out, we made a planned stop at a huge Cabela’s store. Many of us in that convoy, including myself, had never seen such a huge camping store, and were in awe of the full aisles of useful gear that existed in our minds only as black-and-white pen drawings in the CampMor catalogs. Like most of the others on the trip, I spent a lot of time browsing the aisles. I happened to walk outside at one point, and noticed a lone person standing at the end of the driveway of the Cabela’s store, looking across the road. I recognized it to be Steve, so, curious, I walked out there and stood with him. “What is he doing out here when there is such cool camping gear just over there,” I asked myself. Shortly, the answer became clear to me. The ground began to shake, a whistle sounded, and a freight train hove into view. This Cabela’s happened to be across the road from a very active train track, and Steve was much more interested in the trains than anything Cabela’s had to offer. When the noise died down a bit, I remember him explaining to me that this train had a GE drive train that contained diesel engines running generators that converted the power from AC to DC several times before the electric motors that drove the wheels got the power. As usual with Steve, I came away from that event knowing much more than I had. My second Steve story took place within the past year. I knew Steve was very sick but in remission. We’d interacted on and off since the illness, but I’d frankly lost track of how things were going for him with his cancer battle. I called Steve out of the blue because I had an idea. I wanted to build an elliptical track about 100 feet long that would have a small replica of the planet Earth on it. This little earth would spin once per day, and would circumnavigate the track once each year. As I was trying to figure out how to make this work, it seemed to me that train tracks and a very slow moving model train might be the solution. The choice of who to call to pitch this outlandish idea was obvious to anyone that knew Steve. Of course, the final solution did not involve a train, because no model train could move that slowly (a few inches each day) for such an extended period of time. But Steve didn’t just tell me it was a stupid idea and leave it at that. As we talked it over on the phone, I could tell he was warming up to the idea, and with his help, we came up with a much better solution. This project has not made it off the drawing board yet, but if it does, and if it works, it will be due to the ideas I got from Steve during that conversation. I’m pretty sure that phone conversation is the last time I ever spoke to him. So why do we grieve so completely over one death, and hardly notice another one? I think part of it involves touching immortality through our children, and that words are probably inadequate to explain it. It is one of those things that you know when you feel it, but is gone as soon as you think about it. Besides this huge and powerful experience, Steve and I just liked each other. We joked, talked, laughed, cried, and never expressed harsh feelings toward each other. It is one of those friendships that you don’t miss until it is gone. One that teaches while it is there, and instructs every day that it isn’t. You are currently browsing the Rural Life in the UP of Michigan blog archives for July, 2014.